Do You Know the Risks of Diabetes? - Mamanista! Home > Social Good > Do You Know the Risks of Diabetes? Do You Know the Risks of Diabetes? 86 million American adults (more than 1 in 3) have prediabetes and are at high risk of developing type 2 diabetes, a serious health condition that can lead to heart attack and stroke. Surprisingly, nearly 90% of those with prediabetes don’t even know that they have it. But prediabetes can be reversed through weight loss, diet changes and increased physical activity, and the first step to reversing the condition is to evaluate one’s personal risk so that they can take action as soon as possible. That’s why the American Diabetes Association (ADA), the American Medical Association (AMA) and the Centers for Disease Control and Prevention (CDC) have partnered with the Ad Council to launch the first national public service advertising campaign about prediabetes, encouraging people to learn their risk by taking a short online test at the campaign site, which also features information on prediabetes as well as lifestyle programs and tips to help people reverse their risk. The answers to these 7 simple questions can tell you if you’re likely to have prediabetes. Already slipping on your resolutions? Here are some tips to stick with healthy change. What you need to know about prediabetes – and how it can be reversed. Telenovela star joins new prediabetes PSA campaign [and others for Hispanic audiences]. Have prediabetes? If you do, you probably don’t know it yet. Here’s how you can find out. Think you’re too busy for type 2 diabetes? I thought so too. 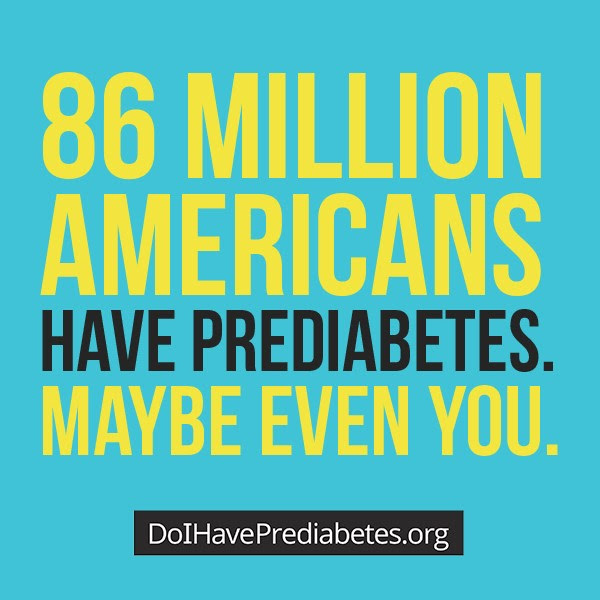 For more information about the campaign visit DoIHavePrediabetes.org or Adcouncil.org. You can find out more about prediabetes and the organizations’ efforts to prevent type 2 diabetes at: ADA, AMA, CDC.